The Arabic verb shahida means to witness, to be present and notice, or to say or do something in order to give evidence; Allah said, “So everyone of you who is present during that month should spend it in fasting” (BAQARA, 185), “..and one of her household saw this and bore witness” (YUSUF, 26). Shahida also means to swear and takean oath “..their solitary evidence can be received if they bearwitness four times with an oath by God that they are solemnly telling thetruth.” (NUR, 6). Witness is a decisive statement; Allah, Praise and Glory be to Him, says, “..and a witness from among the Children of Israel testifies to its similarity with earlier scripture and has believed” (AHQAF, 10), “And they witnessed all that they were doing against the Believers” (BURUJ, 7), “..and whatever deed ye mankind may be doing, we are witnesses thereof when ye are deeply engrossed therein.” (YUNUS, 61), “..and the witnesses will say, these are the ones who lied against their Lord! Behold! the Curse of God is on those who do wrong!” (HUD, 18), “..and let neither scribe nor witnesses suffer harm.” (BAQARA, 282), “..then write us down among those who bear witness” (AL-I-‘IMRAN, 53); that is to say, among those who assert their belief in Allah. Ashhada means to make someone testify or take witness,as in, “..and made them testify concerning themselves, saying,Am I not your Lord who cherishes and sustains you? They said, ‘Yea! wedo testify’.”(A‘RAF, 172), “..but take witnesses whenever you make a commercial contract” (BAQARA, 282). Ashhada also means to make someone present at the timeof something occurring to make him notice it and testify. Allah, Glory be to Him, says, “I called them not to witness the creation of the heavens and the earth nor even their own creation.” (KAHF, 51), “..that will be a day of Testimony.” (HUD, 103), where all the creatures will be present and will witness its horrors, and the angels will also be present. Special testimony is borne by the angels who witness and record the believers’ reward, “..and the morning prayer and reading; for the prayer and reading in the morning carry their testimony!” (ISRAA’, 78). The word mashhad means the time or place where evidence is taken, or where people are produced to be judged; it is an adverb of time and place, Allah says, “..and woe to the Unbelievers because of the coming Judgment of a momentous Day!” (MARYAM, 37). AL-SHAHEED means the WITNESS Who sees, observes and witnesses every single thing, nothing escapes Him in His Kingdom, “..is it not enough that thy Lord doth witness all things?” (FUSSILAT, 53). Allah, Praise and Glory be to Him, decides between people in the most just way, He says, “Say, what thing is most weighty in evidence? say, God is witness between me and you.” (AN‘AM,19). 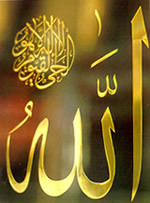 Allah is the Omniscient, the All-Aware and the WITNESS. He is the Omniscient, because His Knowledge is absolute and eternal; when this supreme Mastery over all things blends with the Knowledge of theinmost invisible secrets, then He is the All-Aware; when all these thingsintermingle with the Knowledge of the manifest matters, then He is theWITNESS. Allah, Praise and Glory be to Him, says, “..forGod is Witness to all things” (MUJADILA, 6),He is the WITNESS to all things on Doomsday, Glory be Him, He is Allah.